The act of making a good tomato sandwich is a truly refined art, which takes at least several good gardening seasons if not a lifetime of practiced experience to get it just right. Having been a tomato connoisseur for most of my life, I still consider myself as one who could further refine my skills at making a tomato sandwich “really good”. I tend to be a somewhat sloppy person in the way I go about doing some things. Therefore I must add that at least a part of the mystique that goes into creating this absolutely ecstatic gustatory delight is to know, or at least to sense, the right combination of chaotic messiness and orderliness that needs to go into your work. Bear in mind that there are certain things that absolutely must be in your sandwich, other things that are optional or could be in varied form, and other things that definitely must be left out. It is with these thoughts in mind that I share with you a little of what I have learned over the years of making and consuming these salubrious, savorous sensations. Before you begin, keep in mind that you will be creating much more than a simple combination or stack of food articles put together in such a way that it is possible to eat in the hands without a plate underneath. You will be creating an experience. It will be an experience that involves not only the taste buds but also your visual, olfactory, and tactile senses as well. If you happen to have a loose hinged jaw like mine, you will also be able to add an auditory dimension to this experience as your jaw makes a popping noise when you open wide to bite into your work. Also if you have done the job properly, it will most likely be impossible to eat it without having a plate underneath, unless of course you don’t care about the sticky mess you will be leaving on the table or floor, all an integral part of the whole experience. Bread. It is most important that it is fresh and preferably home made. I like 100% whole wheat the best and rye bread, especially if I have Swiss cheese. Don’t mess with the white stuff from the store and if you insist on using store bought bread then get whole wheat, rye, or multigrain. A good test of bread freshness is to pick up a slice by the edge. 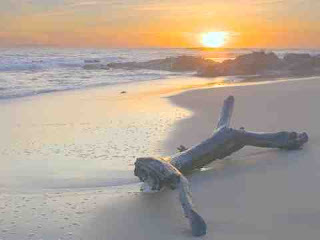 If it is soft enough that it will hardly hold together by its own weight, then it is fresh. Now a slice of fresh store bought white bread might pass this test. Don’t be fooled! They shouldn’t even call that stuff bread! If you really prefer a bread slice that has a firmer texture, there are some multigrain breads that have this quality and are very good. You will immediately recognize that this bread has some real substance. The other option of course is to toast the bread. Cheese. Any good quality cheese is fine as long as it is real cheese. I’m assuming of course that you already know that American processed cheese like you get at the store is a poor excuse for cheese. I favor Swiss cheese but sharp Cheddar is also great as well as others. I always like to put the cheese next to the bottom slice of bread as it gives enough form to the otherwise formless mass long enough to get it close to your mouth and when moist provides a slippery base for the juicy tomato and onion slices later to come. When they go slithering out the sides as you begin to chow down your creation your experience will be further enhanced and challenging. Meat. As a self-confessed meat junkie, I consider some kind of meat in the sandwich to be pretty essential. Vegetarians may differ with me on this point and that is OK. Hamburger or sliced roast beef from grass fed and grass finished cows is the better choice. Ham is great but it should be country ham. Store bought ham will work if that is the best you can do and still must have ham. Ditto for pasture raised chicken or turkey versus commercially produced chicken or turkey. I would stay away from most bologna or other processed meats. An exception is Lebanon bologna, which I happen to like a lot on a tomato sandwich. Fish or other seafood might be a possibility but somehow the idea doesn’t appeal to me much. Tomato. Ah ha the most important part! Get a vine ripened one from the supermarket! Ya gotta be kidding! Don"t even think of using a store bought tomato for gosh sake! Nothing but a genuine homegrown garden tomato either ripened on the vine or finished ripening on a table on the back porch will do! Obviously the best of the best are the old time heirloom varieties like “Brandywine”, “Old German”, “Pruden’s Purple” or “Blosser” to name just a few. Hybrid varieties like “Big Beef”, “Celebrity”, or Burpee’s “Big Boy” are still very good if home grown and properly ripened. These won’t hold a candle to the heirlooms for flavor though. Generally the juicier it is the better. Choose a well ripened one big enough that when you cut a one half to three quarter inch slice about midway between the stem end and blossom end it will be more than big enough to completely cover a slice of bread. Onions. I love them. Others may choose to skip them. Even a store bought onion can work here. Sweet ones are good. I don’t mind if they are a little raunchy though. I usually end up getting the slices wedge shaped, not necessarily on purpose. This adds to the fun of eating your creation though as you try frantically to hold the thing together as onion slices go shooting out the sides as you crunch down. Green Stuff. Yeah, I know that it is well nigh impossible to find decent lettuce during the middle of tomato season. If you can you are plain lucky! Now is your opportunity to be creative. Don’t go to the store and buy “Iceberg” lettuce for Pete’s sake! Swiss chard grows well in mid summer and the young tender leaves work quite well on a sandwich. Also worth trying are the leaves of various herbs, especially Basil. Recently I have learned that the common midsummer weed, purslane, is good (don’t laugh) eaten raw in salads or cooked slightly. I tried it once on a sandwich and it was not bad at all. It has a mild flavor and crunchy texture. Health nuts will tell you that purslane is high in omega 3 fatty acids and among the most nutritious of the edible weeds. Dressings. This usually goes on top so it can work its way down through the layers as you eat, or on either or both pieces of bread before you begin stacking the goodies. My choice is real mayonnaise (not Miracle Whip)! Also good is spicy brown mustard rather than yellow mustard. Another excellent choice is extra virgin olive oil. Some might want ketchup but I think it can be a bit redundant considering ketchup is mostly tomato sauce and you already have tomato as your main ingredient in your sandwich. I have used my wife’s home made ketchup (made with good tomatoes and lots of herbs and spices) quite satisfactorily though. At any rate I would never recommend that red slop that everyone buys at the grocery store! That’s the same stuff people are always slathering all over their fast food in order to cover up an already “blah” taste! To use it on a good tomato sandwich simply doesn’t make a bit of sense! Finish it off with a big slab of dill pickle on top and you are ready to go. So, there you have it, every thing you need to know to make a super tomato sandwich. If you are truly adventurous, you might want to repeat this sequence several times before you put the final slice of bread on the top. It helps to have a big mouth and a loose jaw though. Take it from someone who has both and knows! Now comes the final test. 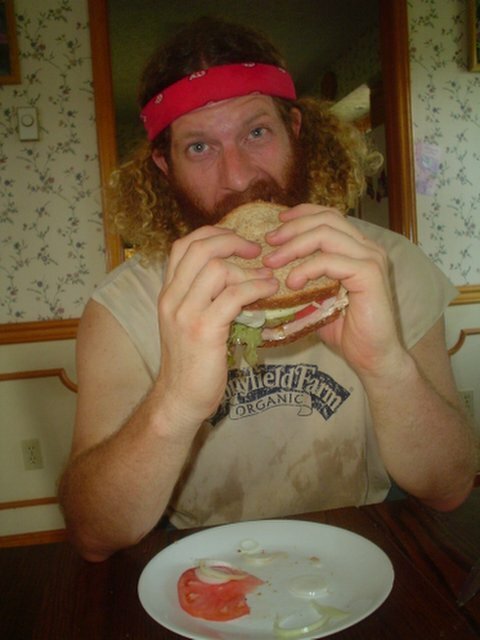 If made right, it will take at least both hands to cradle the sandwich together as you bring it to your mouth for the first bite. If for some reason your hands are not enough to accomplish this feat, you might want to try using one or both of your feet. This assumes of course that you have been doing your yoga. Within seconds you should have tomato juice and mayonnaise dripping off both elbows and smeared from eyebrows to chin, and you should be experiencing something close to absolute sublime orgasmic ecstasy. Only then will you know that you have made a really good tomato sandwich. :>). Uh, if taking the picture from the house roof counts as an aerial photo. 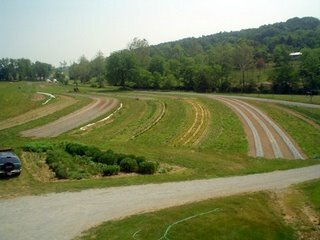 This shows several of the plots where I have laid plastic mulch and have transplanted cucumbers, melons, peppers, and eggplant. The middle plot shows the now expired overwintered spinach planting and the almost expired lettuce beds. Today I finished discing in the old spinach and am preparing the ground for late transplanted onions and a second planting of beets. It's been awfully dry and I am starting to get concerned. 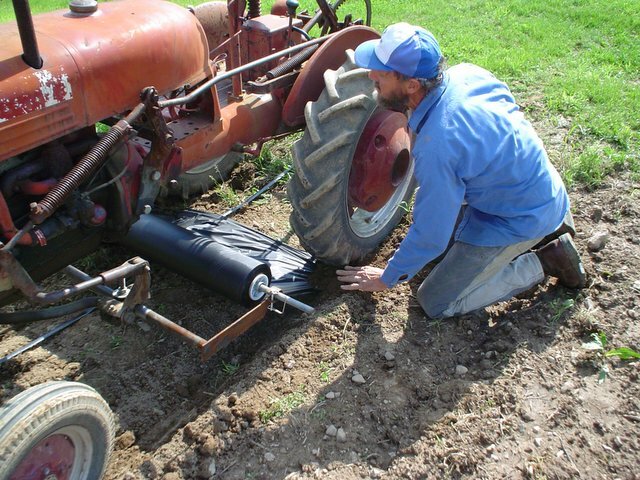 We do have some drip irrigation set up for the most critical areas. Off in the distance one can see the field hoop houses where I have my earliest tomatoes planted. The total length of the field is about 800 feet and encompasses an area of two and one half acres. 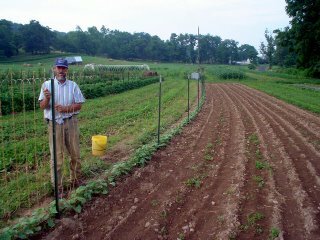 I finished clipping the wire to the top of the steel t posts on the lima bean trellis this evening and plan to run the strings tomorrow. Those limas are really looking good now and looking for something to climb. Christine picked peas today and is bugging me a little to help her to shell them as I write. This morning she called my attention to the fact that a tomato was starting to ripen in the hoop house close to the house. This afternoon she called me over to show me that the vagabond chicken that insists on flying over the pasture pen fence and making the daily traverse of several hundred yard's distance to piddle around the house and garage, had also found it and eaten a big chunk out of the side. Boy was I ever ticked off! Tomorrow I'm either going to get my hands on the booger or shoot her with the 22 and we are going to have chicken soup for supper. Here you will see a sequence of photos showing my home made plastic mulch laying operation. the first picture is a close up of the apparatus holding the roll of plastic under the belly of the tractor and the way I get the plastic started under the tires. The next series shows me forming the bed in preparation for laying plastic. I no longer do the acrobatics o f standing on the rear tool bar while driving the tractor. The extra weight was not necessary. I have more recently added wheels to the rod which carries the plastic roll which makes it possible to carry it higher. I was having trouble reaching the roll to foot brake it as the roll decreased in diameter. Even with the roll carried higher one still needs long legs and a good sized foot to make this work. Yesterday I designed and built a rig for marking holes in plastic for planting with a hand carried device I use to make the planting holes and slugging them with water and fertilizer. It worked well and I was able to put in around 700 pepper plants in a couple of hours. even the dull and the ignorant; they too have their story. Exercise caution in your business affairs for the world is full of trickery. 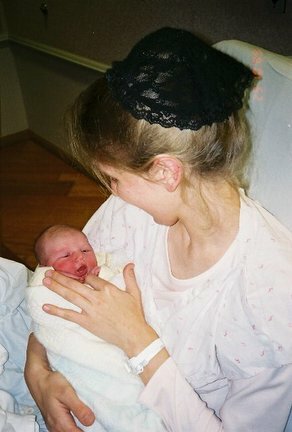 My oldest daughter Celia gave birth to our first granddaughter on April 28. Mother and daughter are doing great and we are all bursting with pride! The field hoop houses are mostly full of tomato transplants by now and the ones first transplanted in the hoop house close to the house on April 15 are now a good 18 inches tall and in need of trellising. There is even an apricot sized tomato on one of the plants! Yay! And speaking of apricots, we have a nice set of young apricots on the three trees I planted about 10 years ago in the orchard south of the house. This is only the second time I have ever seen them successfully set fruit. Our zone 6 climate here is on the fringe of cold tolerance for apricots. We usually get a freeze after the trees bloom sufficient to take them out. About three years ago they set fruit only to drop them later when some sort of "no seeum" bug got to them. I almost cut the trees down this spring but didn't partly because something down deep inside me wanted to give them yet another chance and partly because i didn't get my "round tuit" in time. Maybe global warming will work in my favor from now on. This time, by golly, I am violating my "stay organic as much as I can" rule enough to allow me a spraying or too with something capable of killing these buggers! Then I plan to follow up with "Surround" at weekly intervals or after any rain. I want some apricots! The weather is getting dry again and we need more rain. Saturday the 15th I transplanted the first tomatoes to the hoop house closest to the house with hopes that I will be picking the bright pink orbs by the middle of June. These are not an early variety that can be expected to produce a golf ball sized red but not particularly tasty tomato about 60 days after planting out a six week old transplant. No, these are an heirloom variety called "Blosser" that normally needs 80 to 90 days after transplant which in this area means they will start producing around mid July. 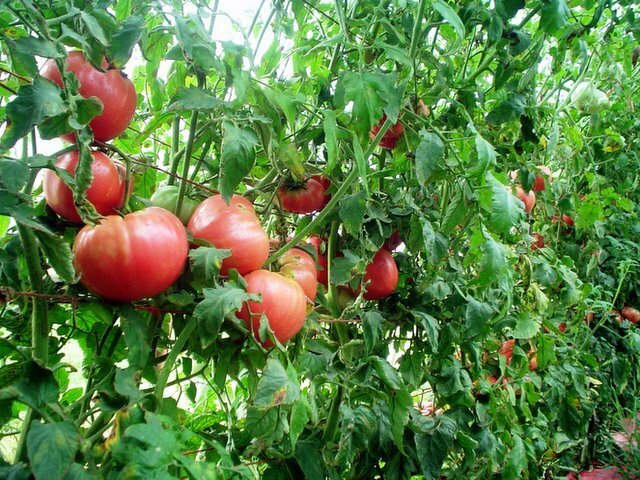 These are the tomatoes that many people would almost die for and if they do succeed in getting them without dying, they will think they have indeed died and gone to heaven when they cut a slice big enough to cover a slice of fresh home made bread and begin chomping into it. I started these babies in mid January in 24 cell insert trays,(double the root ball space of tomato plants sold in most commercial greenhouses). When the plants are about 4-5 inches tall I double dirt them (pile additional potting soil on top of the flats around and between the plants),nearly doubling again the root ball space. This gives me a 10-12 week old transplant with blooms on it and a root ball the size of my fist (I have a big fist)ready to hit the ground a running. By planting them into a hoop house or high tunnel they get the additional advantage of warmer night time temperatures during the weeks of May and early June. Tomatoes need night time temperatures in the 50s in order to successfully set fruit. So it is realistic to get those salubrious Blosser tomatoes before the end of June if they are planted in a hoop house instead of out in the open. 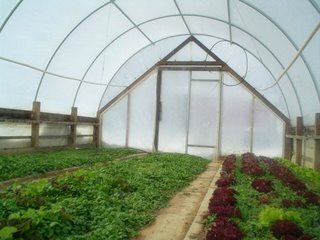 I finished putting the plastic on the field high tunnels today with plans to get plants in them before this week is out. This is about two weeks earlier than I normally plant tomatoes outside. 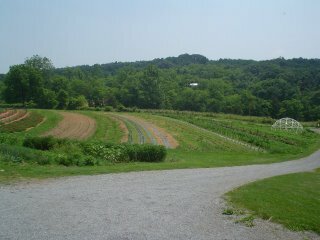 The picture shows a view inside one of the high tunnels last year showing both Red Suns in the foreground (a hybrid determinate variety) and the indeterminate Brandywines in the background. Near this spot I knelt one time and picked a bushel within arms reach without getting off my knees off of four or five plants. Friday night April 14 was a special evening. A spectacular thunderstorm rolled in around 9:00 PM with lots of lightning to light up the world outside, a fitting event for Good Friday. The dogs wanted to come into the house and the most shy one insisted on cowering beneath the computer desk. After awhile I took him back out to the front porch where I lingered awhile to watch the celestial fireworks and to commune with the forces of nature. We have had several rains since and a really nice soaker this past Saturday, a bit too ducky for a Saturday morning market day but we needed it. 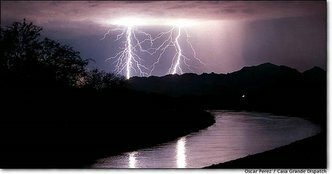 The lightning picture was not taken here on my farm (I'm not that good! )but it captures well the essence of the Good Friday storm and my reasons for going outside to watch it. Friday evening we had a night time thunderstorm with spectacular fireworks-a fitting event for Good Friday. The dogs barked and banged on the front door till we let them in and the one cowered under the computer desk until the thunder stopped. Of course I had to drag him outside for awhile to sit on the front porch, watch the show, and commune with the forces of nature. I went to market the next morning with fresh eggs, spinach in prime condition, and because I have been determined to have lettuce to sell by mid April, some cutting lettuce from the field hoop house. I visited my mom in the nursing home for awhile after leaving the market and got home around mid afternoon. I then decided to transplant tomatoes into the hoop house close to the house, the one I showed in an earlier post with mid winter salad greens. 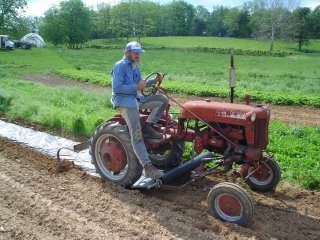 Most intrepid tomato gardeners can pot up an early tomato variety like "Early Girl", "Early Cascade", or "Quik Pic" and have ripe golf ball sized tomatoes, with a flavor that is nothing special, before the end of June. 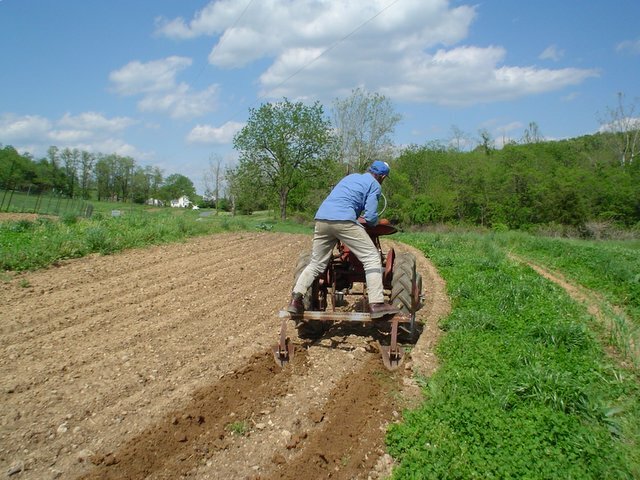 The plants I was planting are a local heirloom called "Blosser" started from seed in late January and transferred as seedlings into 24 cell flats in early February. In mid March, about the time I normally seed my main tomato crop, I "double dirted" the then four inch tall plants by piling more potting soil on top of the flats. This gave me sturdy ten week old one foot tall plants with root balls the size of my fist (I have a big fist)with blooms on them. Blosser tomatoes normally need 80-90 days beyond a 6-8 week transplant in order to mature fruit. 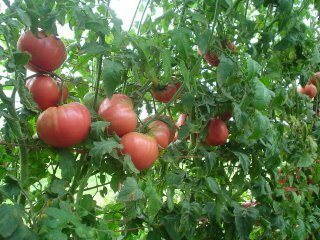 With a little of my neighbors horse manure in the planting holes, some tender loving care, and God's blessings, I can hope to have nice big ripe pink tomatoes by mid June. 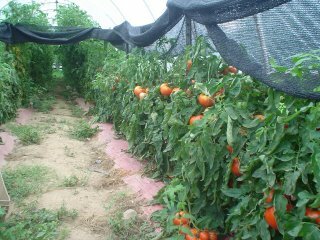 I can maintain warmer temperatures inside the hoop house for the next two months as tomatoes need night time temperatures no lower than 50 degrees in order to successfully set fruit. I was hard to get out of bed this morning. 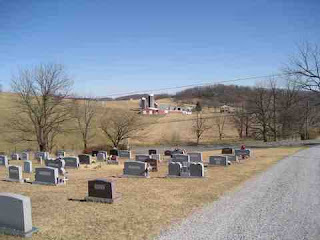 We were to go to a community Easter sunrise service hosted by three community churches at the cemetery on the hill outside of Singers Glen. Finally I dragged on out and when we got there I was glad we went. The weather was beautiful and the scene breathtaking. As the sun came up I gazed at the post card scene of the village of Singers Glen lying in the valley south of the cemetery. To the north lies the now abandoned dairy farm where I grew up and f armed myself for 16 years. The recent rains have really brought out the budding trees and greened up the grass. The rising sun reflected off the tombstones, creating a beautiful glow. What a wonderful time to celebrate the resurrection of our Lord Jesus and the hopes for an abundant season that the recent refreshing rains and warmer weather are bringing forth. We were blessed over the weekend with nearly an inch of slow soaking rain. PTL! It had been one of the driest Marches on record here with less than 1/2 inch of rain and snow for the entire month. Things are really starting to pop now! Yesterday I made raised beds and covered them with black, then red plastic mulch in preparation for tomato planting. Today I transplanted nearly 400 Red Cross and Red Sails lettuce plants and helped Christine haul and spread a mix of wood shavings and horse manure on the asparagus and rhubarb beds as mulch. I then ran to town to run some errands and buy lumber for building four more hoop house ends. 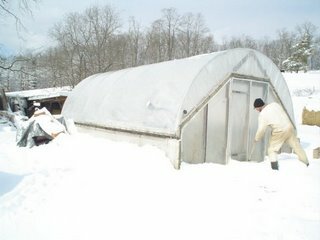 I plan to make the two 100 foot hoop houses into four 50 foot units to simplify the logistics of moving them each season. 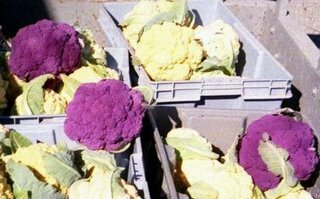 Tomorrow I plan to work on the hoop houses and maybe put some Pemium Crop broccoli and Cheddar cauliflower plants out. The picture is of me building a trellis for pole beans. It is relatively inexpensive and simple to build and dismantle but putting on the drop strings takes some time. I like the background because it shows the busyness of the farm in June when gardening and hay making is in full swing. My wife balked a little when she first saw an earlier version of this picture on my blog. She thought I should have her picture featured here with me like I should value her more than an old dog. She was right. I would have loved to have a picture of her here sitting on my lap in this same chair alongside of this picture with my dog. Wouldn't that have been a hoot! Oh I almost forgot! The dog's name is Booger. 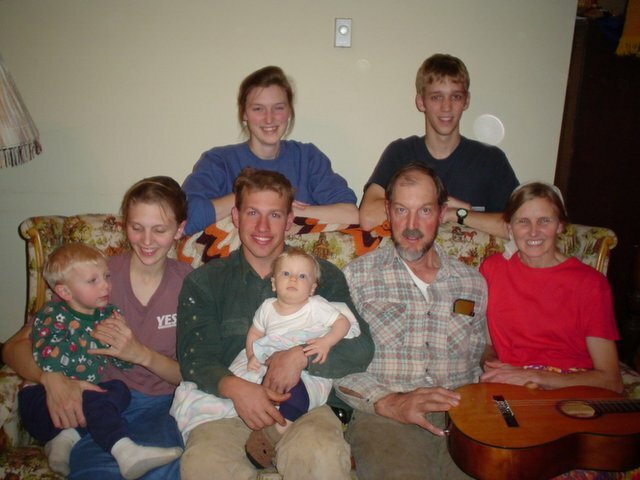 It took awhile to find this nice picture of my family. Back row L to R- my 2nd daughter Rhonda(now married) and son Hans (a student at Berea College KY). Front row L to R-my oldest daughter Celia holding grandson Darryl, her husband Craig Good holding grandson Nevin, me, and my dear wife Christine. This is a typical scene on Tuesday mornings May - October as we pick produce and pack the CSA (Consumer Supported Agriculture) boxes in our garage. We will have over 60 subscribers this year. This is one of my most prized inventions. I rigged this apparatus for my Farmall Cub tractor to lay plastic mulch for around $50. A new commercial three point hitch tractor mounted mulch layer can cost as much as $5000. It's not quite as fast as the commercial machine and I have to lay the drip tape in a separate operation but hey- it sure beats trying to lay it by hand and it gets the job done for a little guy like me. This is as good as a vacation in Florida! And a whole lot less expensive. When the weather is really cold outside like single digits, inside air temperatures here can be in the lower teens. However at the soil level the temperatures seldom go below freezing. This allows a variety of cold tolerant salad greens like lettuces, spinach, cress, kale, chard, etc. to thrive in the coldest months. I've walked in here on a cold morning and found everything frozen stiff. Several hours later with the sun shining and everything thawed out and growing, I could work in short shirtsleeves. We can eat this kind of thing for most of the winter. 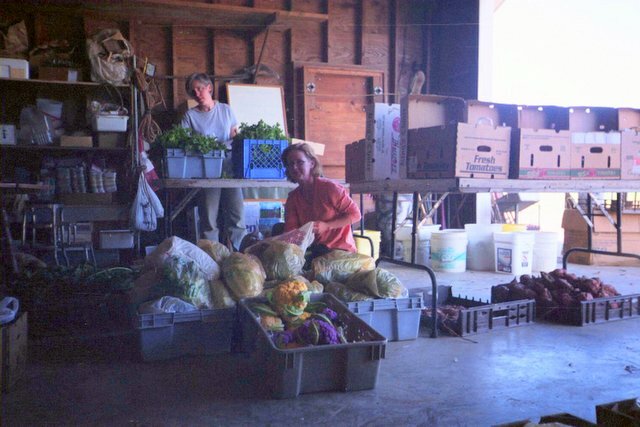 Last year in one six week period we sold about $750 worth of fresh salad greens off of an area no bigger than an average parking lot space, approximately 150 square feet. That is about 1/2 of the space you can see here. The greenhouse dimensions are 14 x 24 feet. Here I am about to take a really short walk from winter into spring . We had just gotten about 10 inches of snow when this was taken. Now let's take a look inside. 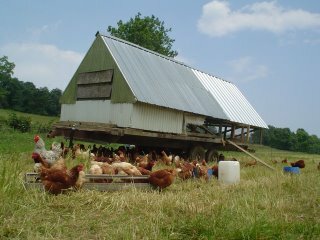 I maintain on average around 125-130 laying hens in this trailer mounted hen house which gets moved to fresh pasture about once per week. An electrified net fence keeps foxes and coyotes away from the chickens and the chickens away from the garden areas and my garage. These biddies spend their summers in the hay fields and cow pastures and spend their winters in the garden areas after the crops are all finished. They do a pretty decent job of cleaning up garden debris, shallow tillage and fertilization of the soil, and are considered a significant part of our pest control program. They really go after overwintering Japanese Beetle grubs and who knows what other ground dwelling pests. In summer they get copious amounts of un sold and over ripe tomatoes and summer squash and the jugs of captured Japanese Beetles we dump into their water from the traps. 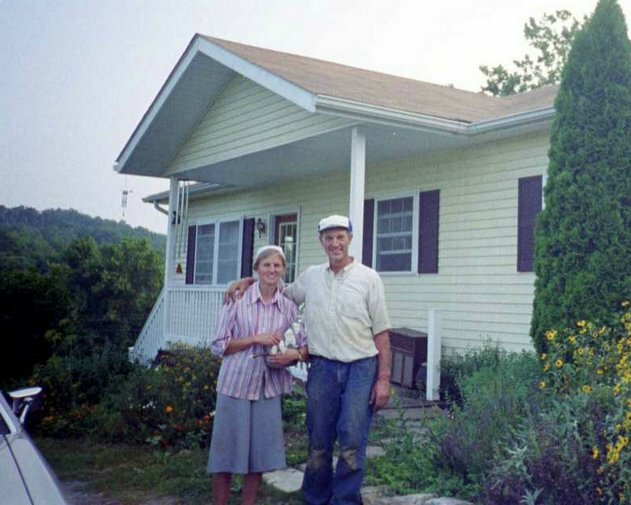 In exchange they present us with the most wonderful tasting and healthy eggs in the world. This is the view of the contoured field strips as seen looking eastward from our front door. The geodesic dome structure in the corner of the field at the end of the driveway is a high school industrial arts project of my son Hans. It serves as a field decoration and landmark for visitors coming to the farm for the first time. I try to maintain a perennial flower garden around the dome with some type of runner beans climbing the dome. I have tried several times to grow lettuce in the then shaded interior during the hottest summer months with mixed success. Alternating with the crop strips are strips of sod and legumes which serve as habitat for beneficial insects, access lanes for getting to the crops without compacting the soil in the crop strips, and as part of my crop rotation and soil enrichment scheme. Every two years or so I plow up the sod strips and plant cover crops on the old crop strips, thus switching them to become the new sod strips. In the foreground you see one of several mixed flower and herb patches located near the house and spotted around various locations in the 2 1/2 acre market garden. 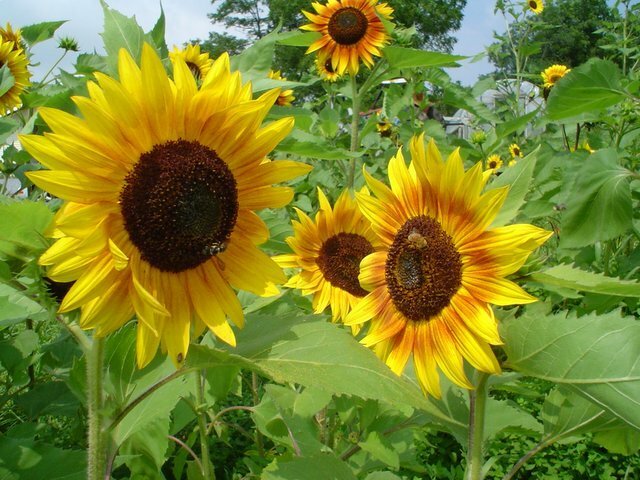 These also serve as beneficial insectaries for attracting predatory insects which help to keep our pestilence under enough control to minimize our dependence on the use of toxic insecticides. This is a picture of the old log house (now torn down) that once stood in the field bordering the south end of our front lawn. 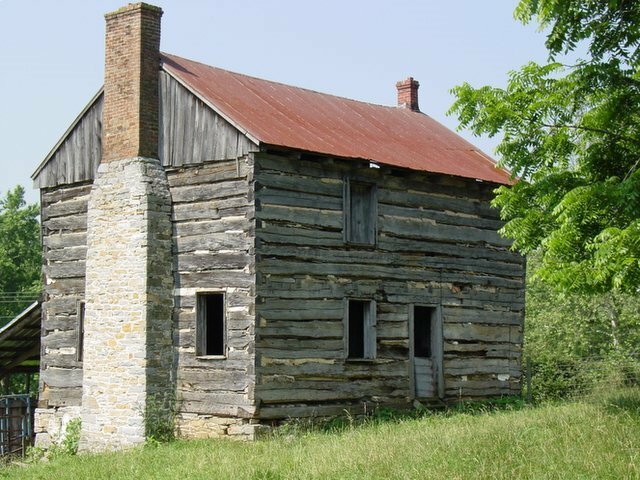 It was in pretty bad shape and had become an eyesore when viewed from the lower side. All that remains is the stone chimney and the stone foundation. 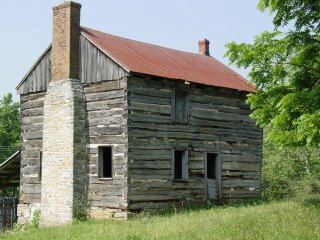 I still plan to refurbish the basement under the front half of the structure next to the chimney and make it into a ground cellar. Then I will build a simple one story rustic storage building on top of the ground cellar and use it for storing stuff like onions and garlic. The brick part of the chimney will most likely be removed. 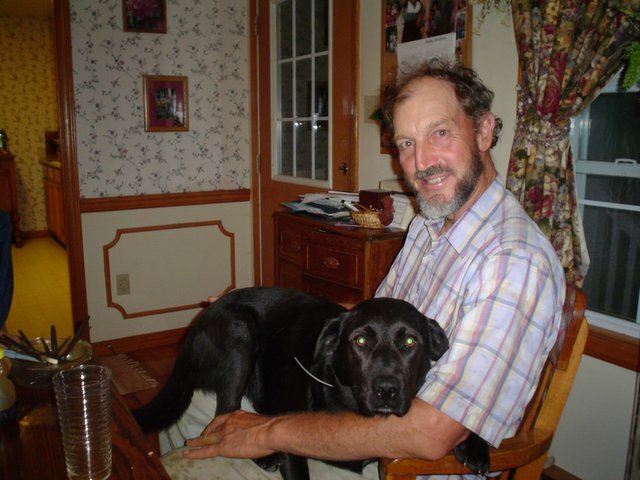 When my wife saw the picture of me with the dog, she said she felt a little slighted. I wish I had one of her sitting on my lap in our dining room just like the one with the dog. Wouldn't that be a hoot! Oh well, this one will have to do. She certainly needs to be on here as she is a very important part of the team. And I really do think she is better looking than the dog.